Jamshedpur FC signs off from the 2018-19 season of the Hero Indian Super League with a game against Bengaluru FC, at the JRD Tata Sports Complex Stadium of Jamshedpur on Wednesday. Already out of contention for playoffs, Jamshedpur FC only has the aim of closing down the gap on the points table. Cesar Ferrando would be aiming to finish off things with a win against top-placed Bengaluru FC. If Ferrando returns in the next season, he has a lot to implement for the future. Bengaluru FC has stormed into the playoffs for a second consecutive time and that too as the table toppers. Carles Cuadrat's objective for the match would be a win to seal the topper position. After the 17 matches, BFC has 34 points from 10 wins. Tim Cahill, suffering from the injury will miss the final appearance for Jamshedpur FC this season. Bengaluru FC will have Nishu Kumar out with a red card. Also, the only foreign players who are with the squad at Jamshedpur are Xisco Hernandez and Luis Lopez. Gurpreet Singh Sandhu, Rahul Bheke, Udanta Singh and Sunil Chhetri haven't travelled as well, according to a source. Bengaluru FC (3-4-3): Soram Poirei, Rino Anto, Gursimrat Singh, Sairuat Kima, Kean Lewis, Ajay Chhetri, Xisco Fernandez, Boithang Haokip, Edmund Lalrindika, Semboi Haokip, Luisma Villa. Jamshedpur FC will have Sergio Cidoncha do most of the work in attack. The Spanish forward has 3 goals and 3 assists this season and has played a crucial role in JFC's run throughout the season. Cidoncha is a player the management would be keen to retain in the coming season. Xisco Fernandez would be the most pivotal presence in the BFC lineup at Jamshedpur. He is one of the most experienced .players among those who have travelled to Jamshedpur. He has the joint-most assists for Bengaluru FC this season with 4. He will be looking to help out the forwards Luisma Villa, Semboi Haokip and Edmund Lalrinka with the goals. Jamshedpur FC will not be taken lightly by Bengaluru FC. But still, Cuadrat is expected to rest his senior players ahead of the playoff, which might ease things up for the hosts. 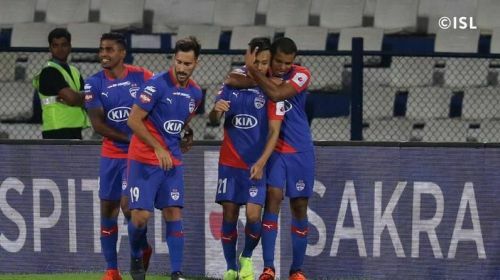 If the Men of Steel can get their attacks gathered together, they could very well breach a likely-weakened Bengaluru defence.